Being an Arsenal fan over the last few years has been unreasonably difficult. The transfer dealings alone have often left the squad lacking in key positions and the amount of trips to the top have been largely offset by shattering lapses in performance. Tuesday’s loss to Olympiacos personified both frustrations. 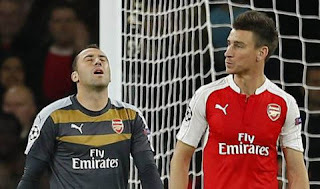 Having fought back from poor set piece defense twice Arsenal’s defense, reduced by one Koscielny, allowed a 3rd goal in shocking fashion. From a viewer’s perspective there isn’t much more to say that hasn’t been said elsewhere. 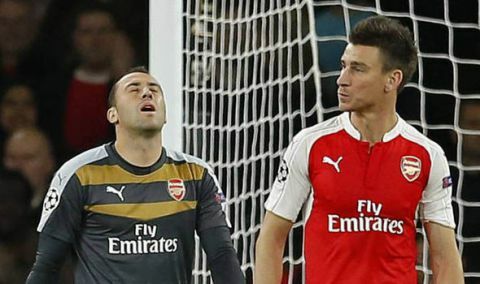 Ospina was beyond poor with the defensive focus in front of him highly lacking. Creativity was null for protracted periods of time and the quality of finish, while adequate, still betrayed a lack of going for net effectively. We’re still in a space where bringing on an additional attacker late in the game feels like an exercise in futility. Be it the preferred option of Giroud or the patented 7 minutes of Yaya Jonogoal Campbell there seems to be no benefit. Nothing should take away from an Olympiacos side that came totally prepared to make Arsenal work. As opposed to the high defensive line that Leicester brought on Saturday Olympiacos let Arsenal run towards a wall of defenders and while there were successes at breaking down that defense they came at the cost of a disjointed effort across the board. So kudos to the Greeks – they won a game they deserved to win and put us in a bad hole for the competition. Moving the focus forward the next few weeks promise to be particularly important for all of our efforts this season. Laying out what one expects from the next 2 months is an exercise in futility as from week to week there are seemingly 3 or 4 different Arsenal teams but there are a core number of benchmarks the team needs to accomplish to give this season a direction that doesn’t end in massive disappointment. Quantifying a failure of the season for me is that the team fails to progress to the knock out stage and fails to win the Premier League. I can accept that going further in the Champions League results in more matches, more need for rotation, and less focus domestically and I can accept that bowing out could give the team greater focus on an unchecked goal of the last decade. What I can’t accept are performances of such lackluster nature that the team’s ability to qualify for the Champions League in the future comes into question. On Sunday we face a top table Manchester United team in front of what promises to be a very passionate, but displeased, audience at home. Under the circumstances I would demand a win but knowing how this team short circuits and sputters I would accept a draw and hold my head up going into a break. Doing so would put us in our standard Top 4-5 position able to progress as the schedule allows. As often seems to be the case with us the break occurs with horrible timing and we come back with 7 games in 17 days led off by Watford. This is a match we must take 3 points while also taking 3 more points against Bayern at home on 10/20. With Everton following I’d like to see us take another 3 at home giving us some strong momentum. While some might sweat the Capital One Cup at this stage it’s a competition I’m happy to see us run out a lineup of, largely, marginal backup talent to rest our main bodies. Inexplicably it starts another 3 game stretch in 3 different competitions all on the road with Swansea and Bayern. The key for me is the Bayern match where we absolutely must claim at least a draw in Munich to give ourselves any shot of advancing to the knock outs. That would leave us on 4 points and I feel like 10 is our best possible outcome at this time. We finish up the meat grinder with a North London derby on November 8th . Tottenham will be looking to put one over on us after the COC result at White Hart Lane but if we’ve done the business needed the result will be less of a burden. The season is still early and looking at how our roster has performed I’m confused and perplexed about what the next 6 weeks hold. Unfortunately that position has become the roller coaster that we seem to ride every year. We’ve seen both our keepers make howlers but Cech is without question the option over Ospina and unless Cech is truly wounded there is no reason for Ospina to be in a first side match. Our defense must improve – all the gains over the past two years appear to have been undone in the last two weeks. We’re finally starting to put in the 2-3 goals a game necessary to win most weeks after an initial drought. Most of our mistakes and issues to date have been mental rather than physical. The physical prowess of this particular Arsenal team will not be sufficient to overcome the bevy of mental lapses we’ve seen.